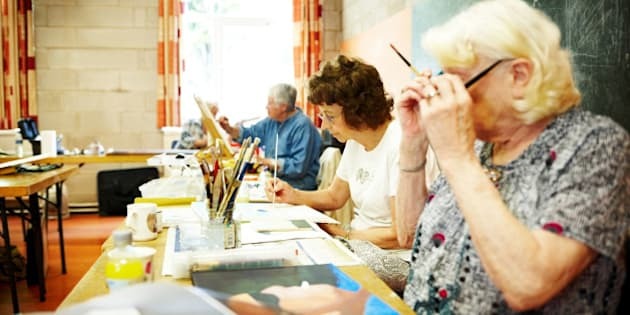 Some studies have shown that open-mindedness, intellectual curiosity and creativity do in fact benefit the aging mind, and may even play a role in longevity. A positive attitude and outlook on life may also factor in. Well-functioning mental capacities may also influence how people age physically. The Rolling Stones have announced the release of a new album before year's end. There may be no big surprises in the offing. Critics in the know say it will be more like going back to beginnings, a retrospective of sorts. Still, I find it nothing short of mindboggling how these guys just keep going after so many decades of - to put it mildly - living life to the fullest. They are all in their late 60s to mid 70s now -- and look at them! They may have wrinkled faces and dyed hair, but they remain lean and full of energy, while most of their contemporaries are likely overweight, balding, and no longer too swift on their feet. So what's their secret? Why do people age so differently? There are, of course, multiple factors to consider. There are genetic predispositions. There are differences in lifestyle, standard of living, and education. There are geographic and environmental influences. There is diet and physical fitness. There is stress and anxiety. There may be accidents and diseases along the way. And yet, there is also something else, something deep inside a person that lets him or her fare better than others. Some studies have shown that open-mindedness, intellectual curiosity and creativity do in fact benefit the aging mind, and may even play a role in longevity. A positive attitude and outlook on life may also factor in. There is no need to stop the music inside before nature says so. The brains of highly creative and inquisitive individuals like artists and scientists often continue to perform at a high level as they get older, and may even keep improving instead of declining, as one would expect, according to Dr. Nicholas A. Turiano, a psychologist at the University of Rochester and co-author of one such study. Well-functioning mental capacities may also influence how people age physically. While there is myriad evidence that physical fitness also promotes mental well-being, surveys have found that people who have many interests, stay closely connected with their social surroundings, and continuously expose themselves to new experiences generally suffer from fewer illnesses and age-related debilitations. It goes without saying that not everyone is creatively inclined or artistically talented. But that is not required. Anything that enhances the quality of a person's life is worthwhile pursuing. It can be travel, continued education, taking up a worthy cause, joining a group of like-minded people. There are endless possibilities. The only constant that matters is that it keeps you occupied, interested and engaged. There is no need to stop the music inside before nature says so. And the sooner you start, the longer you can hear it play.